Digital Plus Screen is an inline digital print module that seamlessly integrates single color UV inkjet printing into high-output flexographic equipment. With the same ink delivery system as Digital Series HD, an award winning full-production hybrid press from Mark Andy, high-opacity digital print is available at the touch of a button. As the printing industry advances, more and more converters are investing in screen printing technology. There are numerous advantages due to the method’s versatility. Screen printing first gained popularity because of its ability to print on substrates that vary in shape, thickness and size. In order for brand owners to compete in high-profit markets - beauty, wine, craft beer and specialty foods - image is everything and screen printing produces results that differentiate product. In traditional label development, rotary screen printing has held a dominant position for highly-opaque, tactile whites and dimensional varnishes. This is due to the unique look and feel rotary screen printing can add to a label. This process is generally executed by imaging a woven mesh and filling in cells to block ink where it is not desired.The amount of ink deposited and the resolution that can be achieved is determined by the screen, with the 305 screen mesh being one of the most common for opaque white. While rotary screen applications is a major value add for brands, it often comes at a high cost for the converter. 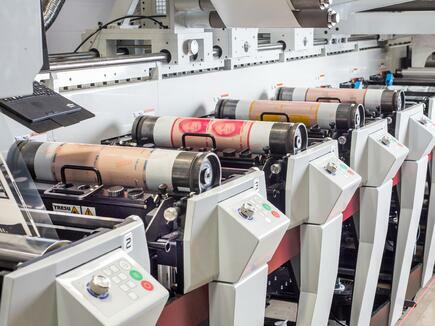 Print providers must take into account the capital costs of the screen units, prepress and storage equipment, as well as the consumable costs of rings and screens. Finally, you have the labor and machine costs of the imaging, setup, cleanup and room for storage. The setup and cleanup times for a typical job can amount to over an hour, leaving the machine idle and unable to run. The Digital Plus Screen partners well with Performance Series presses, providing hybrid capabilities and high quality screen printing. Beyond Mark Andy flexo, the unit can also integrate into any other unit on the market. With these pain points in mind, Mark Andy debuted a new digital solution to rotary screen printing at Labelexpo Europe 2017. The new inline print module seamlessly integrates single color digital UV inkjet printing with the high-production Performance Series platform. Digital Plus Screen, a subset of the company’s Digital Plus Program, is designed to enhance existing presses. It gives users the ability to quickly create dimensional, highly opaque prints without the capital costs, set-up constraints and extensive cleaning needed with traditional screen printing technologies. This process streamlines the entire label production workflow, simplifying the movement of art files to print. Designed with UV inkjet printing with interstation pinning, the module prints fine text, complex gradations and screen-like white ink all in a single-pass and at 240 fpm (73 mpm). The solution is ideal for those after a cost-effective solution to rotary screen work. The unit is available both as a rail-mounted option on new equipment or as a retrofit, enhancing virtually any flexo press (Mark Andy or competing manufacturer model) with digital flexibility. The Digital Plus Screen can be used on a variety of substrates and aid in printing a variety of applications. When pairing the tight registration of the proven flexo with Digital Plus Screen, you can achieve type as fine as 5 point and opacity in excess of 86%. The modular hybrid nature of this device allows you to print white in conjunction with your flexo print to achieve extremely opaque colors with fine line weights. Digital Plus Screen allows converters to stay competitive while keeping minimizing capital costs.